When cryptocurrency was introduced, many people across the world were fast to dismiss it. Most of them could not imagine this, a product of Blockchain technology could get as many followers as it is today. But as years pass, it has become clear that the critics of the system did not have any idea about the potential of the cryptocurrency system. Today, millions of people are registering and at least using the products of this technology. Among the most popular products of cryptocurrency in use, today are the ICO products and the newly launched BitLogic. But since the BitLogic is still a new product, many people are yet to get as much information as they require to get into it. It is for this reason that in this article, we shall look at everything you need to know regarding BitLogic. This is the first thing that anyone who is interested in knowing about BitLogic should know. BitLogic is a new fair cryptocurrency betting platform which allows the users to trade Forex, stock, indices and as well as commodities using cryptocurrencies. The system does not discriminate users of the cryptocurrency tokens. One can trade on it using any form of cryptocurrencies and get equal opportunities to turn his life around. Many people who have been trading on BitLogic have actually earned a lot within a very short period of time. The BitLogic has a user-friendly platform that can allow anyone new to it to navigate through it effortlessly. How to Register on Bitlogic? 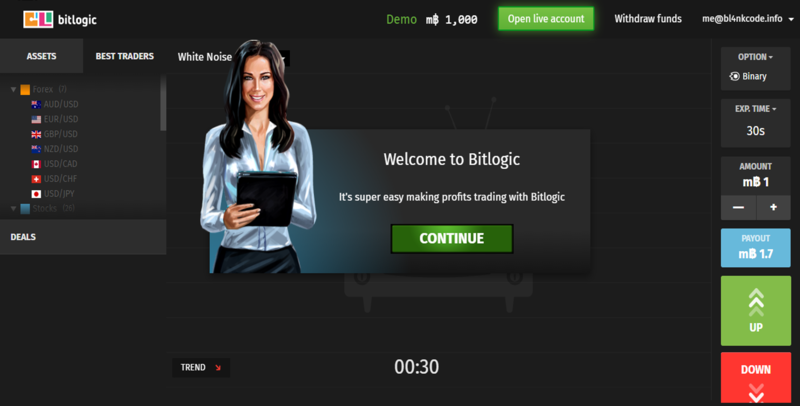 For you to be able to trade on the BitLogic, you first need to sign up. This is because the site does not allow those who are not yet members to take part in any activity on the platform. In fact, non-members cannot be able to access anything on BitLogic, thus cannot even know of the opportunities that it offers. To become a member of BitLogic, you first need to be an adult of at least 18 years old. This is in line with regulations in most of the countries where betting is not allowed among the younger generation. The other requirement is an email address. Every person who signs up on the platform must have an email account. Once you are of legal age and with an email account, you can now Google “BitLogic”. Clicking on the link to the website will take you to the page of the site. You will be able to see a login command. Click on the link and it will ask you for the email address and the password. Besides the login icon, you will see “Sign up.” This is for new members. Click on that icon and it will ask for your email address as well as the password. Type the password in the space that will be provided again for confirmation. This would now enable you to get into your account. How to Deposit Funds on BitLogic? Now that you have an active account on BitLogic, all you need to do now is to deposit some amount on it. This is to enable you to take part in the activities on the platform such as trading in the stocks and Forex. Depositing money into your wallet is not supposed to be in any difficulty. You can deposit funds into your BitLogic account using Bitcoin, Bitcoin Cash, Ethereum, Litecoin, Dash, Ethereum Classic, Monero, and Zcash. The minimum deposit is mBTC 10. Once you have one of the cryptocurrencies mentioned in your online wallet, you are now to participate in BitLogic on the Blockchain platform. How to Withdraw your Funds from BitLogic? To withdraw your funds, you need to visit your account, click “Withdraw funds” then fill in the required field. 1. Fill in the withdrawal amount. 2. Fill in the destination address. 3. Wait until your withdrawal request approved and your payment is processed. Note that you can only withdraw if you deposited your BitLogic account already. Also, you will have to remember that you can only withdraw your funds using Bitcoin as it is the only supported coin at this time but BitLogic will make sure that more cryptocurrency will be added soon to withdraw your funds. The minimal withdrawal amount is mBTC 1 or 0.001 BTC and all other withdrawal requests will be processed by BitLogic within 48 hours. For you to open a bet-fair demo account, you must be a registered member of the system first. Once you log in to the account, you will go through a guide on how you are supposed to trade. On the bottom left corner of the demo page, there two options, “Up” and “down”. Click on any of them. The steps or pretty simple to follow as there will be a guide all the way. Unlike other betting platforms, the BitLogic provides the highest level of security to both your money as well as the information. Built on a Blockchain technology, the system works on a closed loop policy, meaning that every detail regarding a transaction is treated as private and confidential and restricted only to the transacting parties. While registering on this website, there shall be no personal information required. This is because the BitLogic bet-fair is a digital platform that uses digital currency to trade. With the system, cases of cyber crimes are actually unheard of. The system is unique when compared to other betting platforms. Its interface is user-friendly and even without a lot of knowledge about it, you will be able to trade and earn money with BitLogic Now, BitLogic is available for Android and IOS platform link below..